The Broken Arrow Performing Arts Center (BAPAC) acts as a cornerstone of the arts district in the downtown area of Broken Arrow, the largest suburb of Tulsa, OK. The system includes 18 Bose RoomMatch loudspeakers installed in three arrays, plus eight RMS215 subwoofers.Completed in 2009, the 86,200-square-foot facility incorporates a 1,500- seat performing arts venue that has presented acoustical challenges as the theater’s entertainment programming has evolved over recent years. BAPAC’s administrators called in professional assistance and recently replaced the original sound system with a RoomMatch loudspeaker system from Bose Professional Systems Division. 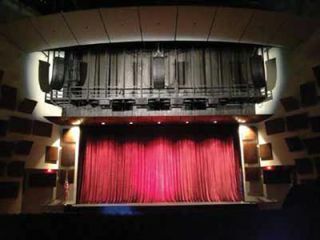 The room and the installed sound system were not working well for the Broadway series applications, according to LaBouff, so BAPAC hired acoustical consultant Chips Davis of Concord, CA-based Chips Davis Design to evaluate the problems. “There was no absorption anywhere in the facility—apart from the audience. The room was very, very live,” reported Davis, noting that it was more suited to symphony concerts than as a multipurpose venue. The installed system includes 18 Bose RoomMatch loudspeakers installed in three arrays, plus eight RMS 215 subwoofers, powered by a total of 11 PM8500N amplifiers, with management via Bose ControlSpace software. “The system is set up with a center point-source array for vocal reproduction, and left and right stereo arrays for hard-panning musical effects,” LaBouff elaborated.